Tim & I just wanted to say a big thank you for arranging our Paddle Board Bag ‘Summer Time’ with such short notice pre-christmas. We were absolutely wrapped with the bag, not only did it arrive before we went away and needed it, it is so well made and we just love it!! We had the board and bag up with us on a boat in the Marlborough Sounds and it worked really well tied onto the side of the boat. Stash-it Board Bags have been an integral name in the New Zealand surfing industry for as long as I can remember. Helen Jowsey, the matriarch behind the whole she-bang, has been consistently producing the best in protective sheathing for your stick for over 20 years. Full credit to the girls/guys at Stash-it for making a kick-arse product!! I've got a few of their products off the shelf or custom made (this longboard bag inc.) and I'm stoked with the quality of workman ship and materials used. The recycled billboard canvas is awesome and strong as!! I'm concerned about resource consumption so the fact that not just the billboards but the foam too being a recycled bi-product is really cool. Not many people these days make a product that lasts, because then the customer doesn't need to buy a new one the next year. I'm happy to pay a bit more if it means its not crap from china that is expected to fall apart. I'm also a big fan of buying NZ made and supporting local industry, no where, I know of, can you get a customised bag and talk to the person who is going to make it. (and if you catch Helen on a good day she'll make you anything you want!!). Good work Stash-it!! Came to Stash-it needing a custom bag for my treasured spoon board bag by George Greenhough. 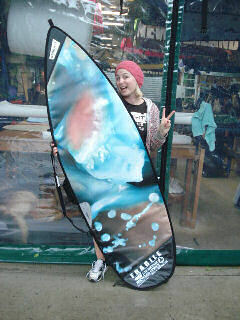 Helen measured the board up & had a bag made within days, Fits like a glove, totally stoked. Love my new cover, Thanks to the team at stash-it. 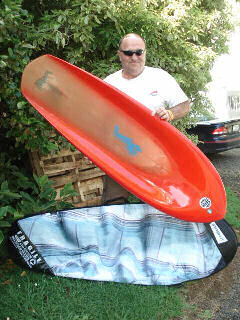 I just took delivery of my new recycled surfboard bag from NZ manufacturer Stash-it. The thing is that this bag is made out of an old billboard, It's totally unique and I get to lower my carbon footprint. How cool is that! 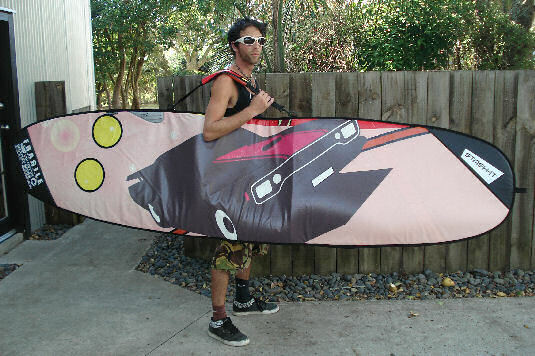 If you want to have a totally unique, hard wearing and cool looking custom made bag for your surfboard (or snowboard) I urge you to contact Helen. She's a top chick and knows how to make really high quality bags. Buy Kiwi made and get Quality! 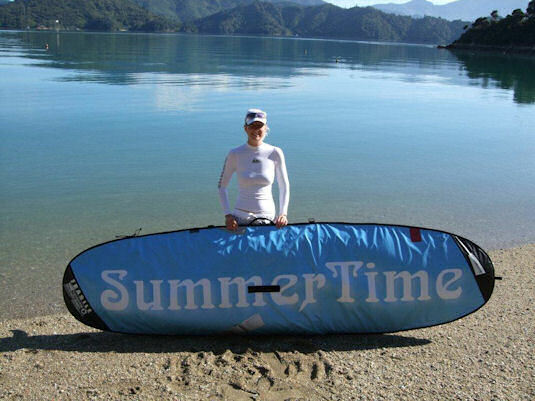 Thanks Helen and the team for years and years of great surfboard covers!. 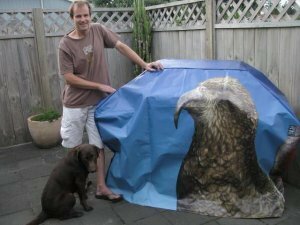 . . . . and now my new BBQ cover too! Just writing to say a big thankyou. I was competing at the Royal New Zealand Air Force Interbase Boardriders competition in May earlier this year, and won a sweet Stash-it boardbag kindly donated by you guys! 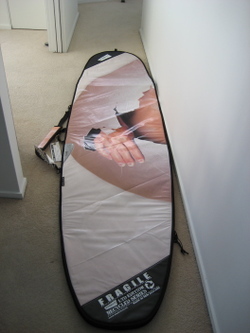 The 6.4 bag is gonna be perfect for the 6'3 custom I'm looking at getting made, I was stoked to win such a nice prize! We really appreciate your sponsorship for these Air Force surfing events and it gives everyone an incentive to compete a little harder when there is such cool prizes up for grabs. I just want to thank you for the prompt and pleasant way you dealt with the faulty zippers for my waveski board and beach bag. To get a reply that the repair had been finished in less than 24 hours was great! Beside that the manner in which it was dealt with was really great, no questions asked about the fault and no waiting to get the bag when I picked it up. It is simply good business: produce a great product, back the quality of the work (because your staff are obviously very skilled), and treat customers as if they are the only ones that matter! I will definitely recommend you to anyone who could use your products and services! Cover arrived today - looks great! Just to let you know I appreciate the fast and professional service you deliver which sadly seems to be pretty rare these days. Dear Helen – just letting you know the board bag arrived and fits board perfectly. You have been a pleasure to deal with and I congratulate on your excellent customer service. Thanks for the paddle bags I picked them up today. They look really good and work perfectly, thanks again.